“We were snuggled under the covers watching the Superbowl. My husband’s phone rang and he slipped into the nursery to take the call. A few minutes later he came back into the room. His eyes were wide and his face was a little pale. “Ronan was born,” he said quietly. I didn’t believe him. I had meticulously scribbled out a countdown on my work calendar for when we would leave for North Carolina. It wasn’t time yet. There was a pause while the words sunk in and we just stared at each other. Then I screamed with glee and ran over to him, trying to figure out how to kiss him and hug him while jumping up and down. We sprung into action. David worked on airline tickets and I began shoving clothes into our suitcase. I stopped mid-shove and it hit me. Two. Months. Early. Almost to the day. The thrill I was feeling suddenly turned to terror. Is he okay? Can he breathe on his own? How fragile is he? And the dreaded question I tried to push from my mind…do they think he will make it? That was the beginning of a million questions and terrifying thoughts that would enter my mind before we made it to the hospital. After a three-and-a-half hour drive to the nearest airport, two delayed flights and a layover, we finally made it to our destination. By the time we made it to the NICU we had been awake for 38 hours. But do you think we cared? David and I walked into the room gingerly, glancing at the dozens of isolettes, wondering which one held our son. We were lead to one at the back of the room that was covered in cords, blinking lights and machinery. There, beneath all the tubes and monitors lay the smallest human being I had ever seen, all three pounds and 15 ounces of him. He was perfect. “You can touch him,” one of the nurses said. I opened up the tiny door to the isolette and hesitantly reached my hand out to touch his back. He flinched, then settled under the pressure of my hand. I felt the first of many tears to come well up in my eye. If you would have told me three years ago that I would have a baby who struggled with neonatal abstinence syndrome (NAS), I probably would have looked at you like you were crazy. I’ve been blessed to live a life far away from drugs, alcohol or other addictive substances. When we decided to adopt, we knew there was a good chance of having an NAS baby and we tried to prepare ourselves. I mostly thought it would be like having a colicky baby. No one told me about the tremors. The screams of pain. The deep convulsions of the ribs in as he tried to breathe. I don’t think anything can really prepare you for that. NAS babies get scored based on the severity of their symptoms; the higher the score, the worse the symptoms. Ronan’s lead nurse, Trisha, said our little guy scored a 24 the first time she met him. She had never seen a score that high in all her years of nursing. The first time I held my son I thought he would break; he was so fragile. It was difficult to work around the various wires and tubes and I felt like I was holding more equipment than baby. But I held him close to my heart so he could hear it beat and I thought his breathing might have slowed the tiniest bit. It wasn’t long before Trisha asked me if I would consider doing skin-to-skin with Ronan. I grinned and whipped out my NüRoo pocket and said “I have this shirt!” As a major skin-to-skin advocate, she was fascinated by its design. I slipped on the pocket and Trisha helped me ease the little three-pound sweetie onto my chest. I will never forget that first time I did skin-to-skin. He was finally calm. The tremors were less frequent. He was breathing almost like a normal baby. After a couple weeks, my parents had come and gone and David had to travel home so he could go back to work. Life goes on. The day after their absence I was overwhelmed by a feeling of loneliness and maybe a little self-pity. On top of all of that, it turned out to be the worst day Ronan had yet. I was devastated. He was improving! He was making progress! Why the setback? Why now? I held him skin-to-skin on my chest for 12 hours that day. He mostly screamed. His tiny body tremored and convulsed constantly and I could tell he was in pain. I shed a lot of tears that day and felt ashamed that I had a woe-is-me attitude earlier that morning. I wished more than anything I could feel the pain for him so he wouldn’t have to experience it. The only break I took that day was to get lunch in the hospital cafeteria. I must have looked pretty pathetic because the cashier gave me a discount “just because.” I was choking down tortellini between sobs when Trisha appeared and sat across from me. She comforted me and reminded me that keeping baby close to me was the best thing for him and that it really was working. Her words gave me strength and I continued to dedicate my time to holding Ronan against my skin, and watching him take comfort in my strong heartbeat and steady breaths. But the days were still long. If I had a dollar for every time I asked the nurses and doctors the question “when do you think I can take him home?” I could probably use that to pay for Ronan’s hospital bill. The answer was usually something like “I wish I knew,” or “it’s hard to say.” But my least favorite answer (and the most measurable) was “I wouldn’t plan on getting out of here until at least his original due date.” April 6. I was going to be in North Carolina until April 6. That wasn’t going to work for me. I was going crazy eating hospital food, only seeing David on the tiny screen of my phone and being confined to such a small area. I wasn’t the only one who wanted to get out of there. Ronan hated being bothered every couple of hours to change tubes, take his temperature or be stripped down so they could get an accurate weight. I can’t say I blame him. I just wanted to take my baby home (I said those words a lot, too). The hours of skin-to-skin were healing for both of us. I whispered words of encouragement and held him close. I watched him get stronger almost by the hour. 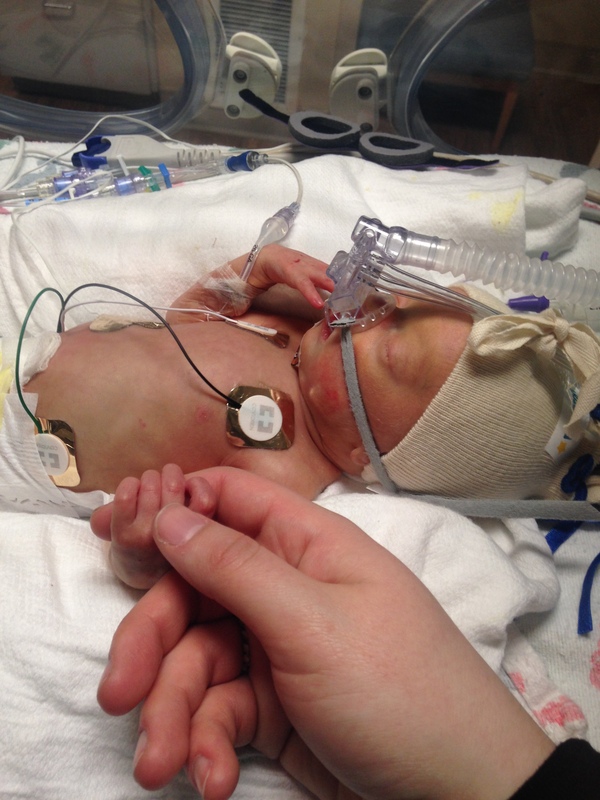 The doctors and nurses were blown away by the progress he made in such little time. Ronan was discharged from the hospital on March 8, almost exactly a month after he was born and a month earlier than doctors estimated. My guy is a fighter. I credit his recovery to many things. Thousands of prayers were said for Ronan by family, friends, acquaintances and even strangers who learned of our story through social media or by word of mouth. This boy was destined to be a part of our lives and I know my cries to God for help were heard. I think Ronan drew strength from that. I also credit his fast recovery to the healing power of skin-to-skin. Nothing is worse than watching your child be in pain. Choosing to hold him was the only thing in my control. I would do it all over again. Casey, David, Ronan and their two dogs are moving to Arizona where David will start medical school and Casey will continue to work as a graphic designer. David and Casey have been married for almost four years, during which they had losses and heartaches as they tried to have a baby. Ronan is an answer to many prayers and he is doing great! He is a healthy, happy baby boy and he is growing like a champ. He is excited to spend lots of time with his grandma and grandpa in Arizona and has many doting aunts and an awesome uncle. He might be just a tad spoiled because he is the first grandbaby on both sides–but he doesn’t know it yet. Read more about their family’s journey at http://www.ourfamilysmissingpiece.com/. *Photo credit: Family photo taken by Jeff Sampson Photography.